Let's translate the energy of the People's Climate March and the Trump resistance into political impact in NYC: join a town-hall style event to send a message to our city's leaders. Come learn about the issues, and then hear about our city's leaders' views, hold them accountable, and urge them to take the bold policy action we need! With Trump taking us backwards in the fight against climate change and inequality, it's now even more important that NYC step up. New York produces massive climate pollution and is also riven by inequality. We can fight both of these moral crisis at the same time by getting our top elected leaders to take action. Our city-wide elected leaders who make the critical decisions on climate, jobs and justice are invited - let's show them bold action on these issues is vital! 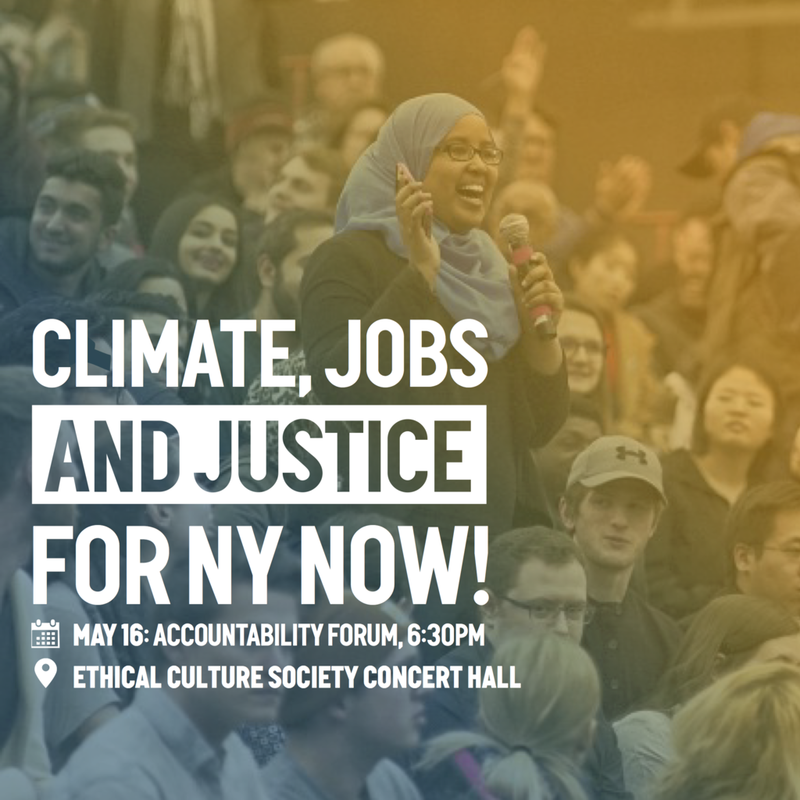 Please join hundreds of your fellow New Yorkers at this important town-hall style event to stop climate change, create good jobs, and ensure justice for all. This event is co-organized by the People's Climate March - NY, 350.org, 350NYC, ALIGN-NY, Bronx Climate Justice North, Catskill Mountainkeeper, CUNY University Student Senate (USS), DSA - Climate Justice, Faith in New York, Food & Water Watch, Frack Action, Green Education and Legal Fund, Natural Resources Defense Council (NRDC), New York Communities for Change (NYCC), New York Lawyers for the Public Interest, Sane Energy Project, Trade Justice New York Metro, Transform Don’t Trash NYC, United for Action, VOCAL-NY, WeACT for Environmental Justice and the Working Families Party.